How to protect your own copyright of a video/movie? It’s tried and true practice that is adding watermark to a video. It depends on your personal needs of adding types of watermark including website url, company/individual logo, and some special texts. Here comes the question – how to add watermark to a video. Is it difficult? The following part will take you into a solution of adding watermark to a video without any trouble. 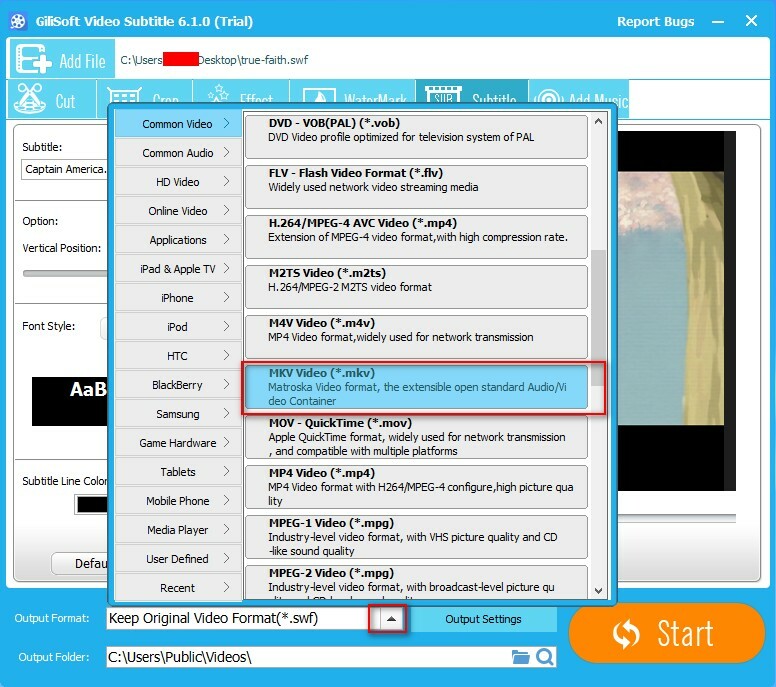 Before jump right into the following steps, you need to download and install an easy-to-use video editor, which includes adding watermark function. Gilisoft Video Editor is highly recommended here since it’s notably simply and fast. 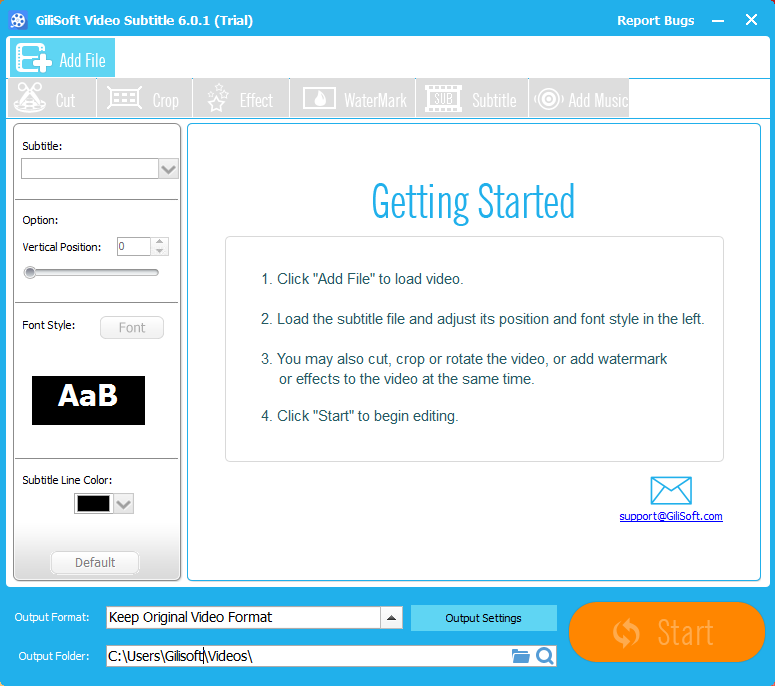 Download the Gilisoft Video Editor from the button below. And then install it step by step according to its installer wizard. Once it’s successfully installed, just run it, and you will see the program window as shown in following picture. Select the “Watermark” module, and then click on the “Add File” button to import your source video file in which you want to add watermark. After loading your video file, you can add watermark now. And you can choose which type of watermark you are willing to add – Text and Picture. On the left side of the main program window, you can find two icons. One is used to add text watermark, the other is used to add picture watermark. Below is an sample of showing adding both text watermark and picture watermark. 1. Set duration of your watermark – you can decide where to add watermark to your video. 2. Adjust the transparency of your watermark – to better fulfill your requirements, you can change the transparency of a watermark. 3. Watermark size – you can set the size of a watermark. Gilisoft Video Editor is also a video converter software. 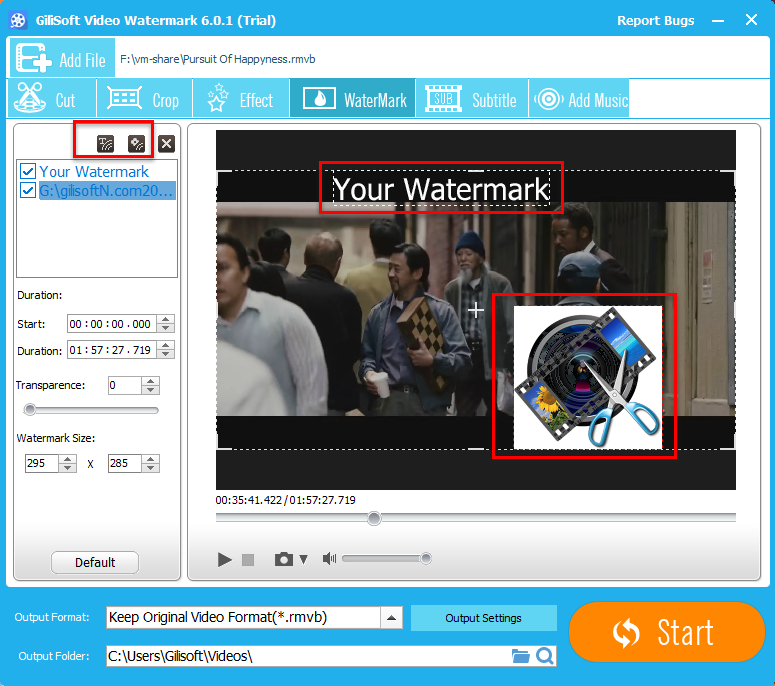 That means you can change the output formats of your video during adding watermark process. There is no doubt that if you don’t want to change the output format, just keep it as original. Converting a video format is mainly suit for multiple devices needs. When everything is done, please click on the “Start” button to finish adding watermark to your target video.